Spectacular lakefront location and home describes this 5 BR, 4 full baths, with 4, 124+/- sq. Ft. 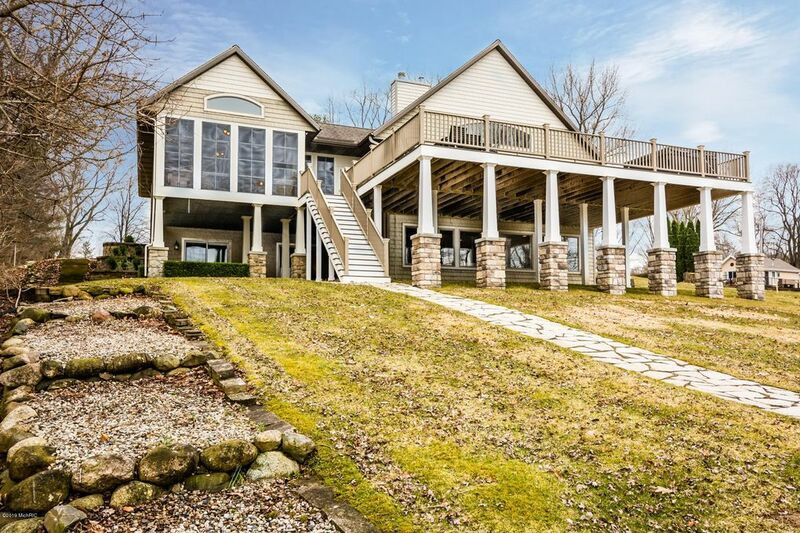 This home is in a very private setting overlooking picturesque all sports Paw Paw Lake. New deck, new hot tub and new extended boat dock boasting 54.5 ft. of outstanding frontage. The large boat dock with sunning deck is great for watching the kids jump and swim to your floating raft. The inviting lakeside 3-season room, multi-decks/patios, and tons of soaring windows maximize your lake views. Resting on .80 of an acre, this jewel of a home offers a manicured lawn with a customized drip and spkler system. You will appreciate the attention to detail in this professionally decorated 2-story home with an open floor plan, sky high vaulted ceilings with updated appliances, an inviting snack bar, massive lakeside great room that boasts unobstructed lake views, an alluring fireplace and an open dining area. The main floor master suite has walk-in closets, so many details. Call pawpawlakepatty. an inviting snack bar, massive lakeside great room that boasts unobstructed lake views, an alluring fireplace and an open dining area. The main floor master suite has walk-in closets, custom window treatments and master bath, and the upper level master suite is a true charmer with its own appealing full bath. The huge and convenient lower level walkout has a large media area, family room game tables, bar top with marine varnish counter-tops, beverage center, microwave and a versatile customized bar area with a flat screen television that's perfect for watching TV or playing videos games. Welcoming fire pit area, security system, generator, main floor laundry, attached 2-car garage and so much more! Call today for your private showing.